Feeding up New Mums | WWAM Bam! As everyone who has come into contact with China knows, food holds a very important place in Chinese culture. I learnt this very early on in my relationship with my Chinese husband back in 2004. During my first visit to the UK home of my in-laws as their son’s new girlfriend, I was encouraged to eat as much as possible of their delicious home-cooked food. Though all wonderful, knowing when to stop eating was a real challenge for a polite English girl who had been taught to ‘finish her plate’. Over the many subsequent visits and several trips to family in China, I realized that eating very slowly was the key to enjoying it all! When my husband and I decided to start a family last year, as I should have expected, my in-laws responded by cooking. Although they live sixty miles away, they began appearing at weekends bearing a whole array of meals to support the pregnancy. Our freezer rapidly filled up. My husband and I both love Chinese food of course, but sometimes a quick pizza is an easier meal! When I finally went into labour, my own parents waited anxiously in their home two hours away for further news. In contrast, my in-laws assertively moved into the home I share with my husband. The moment they arrived, they began preparing food. And as soon as I was fully conscious after the emergency caesarian, the first delivery of home-cooked cuisine appeared on the maternity ward. Plastic tubs of comforting Chinese dishes were carried straight to my bedside, still hot from our own kitchen. I realized that of course this was how Chinese families got involved! However, I had not known that Chinese tradition dictates recuperating mothers should eat only very specific foods. No cold food, no spicy food, no shellfish. My mother in-law had apparently spent weeks scouring the internet for the latest recipes for new mums. She’d even looked at some UK websites to see what UK mums should eat. She had been very disappointed that the advice was simply to let us eat whatever we fancy. 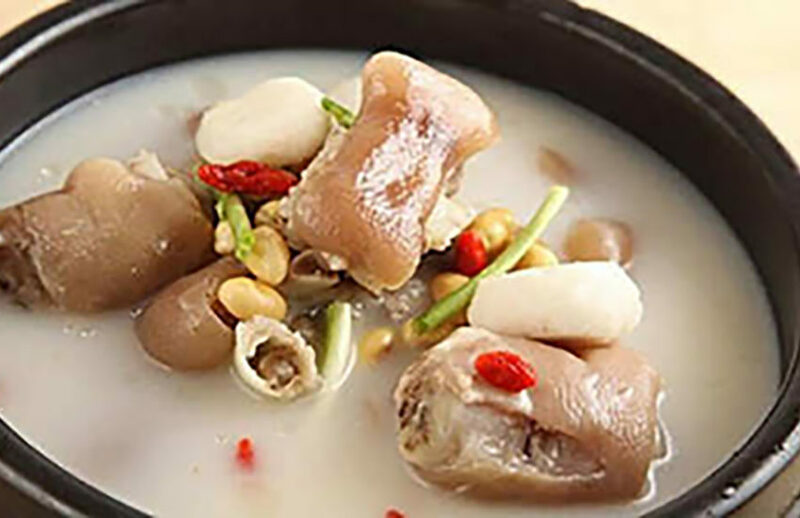 So, my mother-in-law stuck to what she knew best, and I found myself eating a lot of hot soups, involving ingredients such as pigs feet and oily fish. Not exactly what I craved after 40 hours of labour! But overall I am extremely grateful for the care and consideration that has been given to my nourishment during recovery. Perhaps as I nurse my beautiful new Chinese-English baby, through me she will be having her first experience of the wonders of Chinese cuisine too. Now I am only left to wonder what she will be given to eat by her Chinese grandparents first! I will keep you posted!